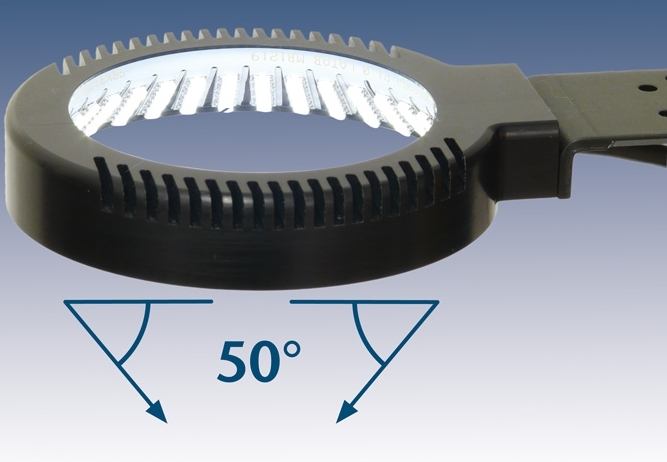 LATAB, the Swedish specialist for LED illumination in machine vision applications presents a new highly homogenous ring light. It is characterized by a 50 degree inward aligned light output which places it between conventional ring lights and dark field lights. This kind of illumination is e.g. used for the shadow free lighting of the inside of cylindrical objects. Continuous light and stroboscope mode is possible. Especially for this kind of illumination heads developed LATAB controllers as well as controllers from third party suppliers can be used. The ring light is available in two sizes and five light colors: red, white, infrared, blue and green. The aluminum casing is designed to withstand harsh industrial applications and has fittings for Bosch or Montech profiles. For further information about LATAB LED illuminations visit www.latab.net.